Why do you need a bigger antenna for channel 2? Half a century, America’s suburbs were dotted with giant antennas. Your neighborhood might still be dotted with big antennas like the one above. They’re great, but most folks within 50 miles of broadcast towers don’t need them. Most of us have replaced our antennas with something smaller and more efficient, like the amazing HDB2X that pulls signals out of the air super-efficiently. The range of frequencies from 54-82MHz has been used for channels 2-6 since television frequencies were allocated in the 1940s. However, the original plan for digital television involved abandoning those frequencies. At one point, the thought was that all TV broadcasting would go on frequencies higher than 470MHz. That didn’t “quite” happen… many cities have at least one channel broadcasting somewhere below 470. However most cities have abandoned the range below 85MHz. (Is your city one of them?) That’s a good thing, and I’ll tell you why. There’s a simple formula for the size of the antenna you want. The antenna should be length of the signal wave. If that’s not possible, it should be exactly half or one-quarter the length of the signal wave. Let’s unpack that. Wavelength is a measure of where a signal falls on the “broadcast spectrum.” All TV signals travel on carrier waves. If they didn’t, there would literally only be one channel, ever. Every signal in a city is on a different carrier wave. This way they don’t interfere with each other. You don’t think about it, but you do think about frequency. Frequency is just another way to look at wavelength. It’s measured in hertz, while wavelength is measured in inches, feet, or meters. You know all about frequency. It’s how you tune radio stations for example. Is your station on 101.1? That means its carrier wave is at a frequency of 101,100,000 hertz (101.1 megahertz.) Frequency describes how many waves happen during a second. The more waves, the shorter the waves. Here’s a photo showing it. See how the low frequency waves are longer, because they have more space? There are tons of converters online which will let you convert frequency to wavelength. If you know what frequency a signal is on, you can determine the size of the wave. I’ll do the math for you. Channel 2, which sits at 54MHz, has a wavelength of 18 feet, 3 inches. Yes, really. That’s why old school antennas are so big. To get channel 2 effectively using a “half-length dipole” you need a 9-foot pole. That means a big antenna. On the other hand, a half-length dipole that picks up channel 14 only needs to be a foot long. 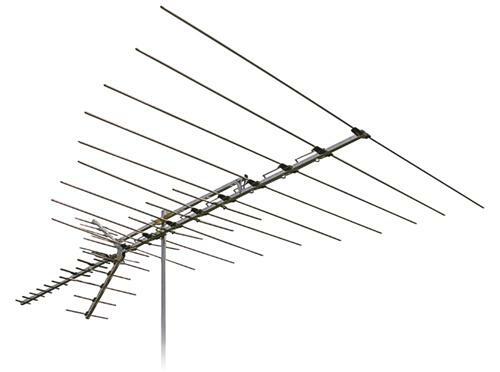 with the FCC repack coming up, you might end up needing an antenna that picks up channels 7-13. That means an antenna 33″ wide. That’s better than an antenna that’s 9 feet wide, and it’s within HOA rules as well. So you might be wondering why you don’t need a 60″ wide antenna to get that radio station at 101.1MHz. Great question! You actually would need that wide of an antenna to get that channel effectively. However, radio is nowhere near as complex as TV, so an antenna that’s one-quarter or one-eighth the size is just fine. If you think about it, your car’s antenna is probably in the range of 30 inches. What is a good material for an antenna? Can you use your home’s wiring as an antenna?